The cable was manufactured by Glass, Elliot & Company and laid by them using CS William Cory between Dunwich and Zandvoort for the Electric and International Telegraph Company. Length was 129 nm. and the cable construction was four single-strand copper wires No 13 BWG covered with gutta percha to No 0 BWG and ten iron wires No 00 BWG, the armouring having a left-hand lay. Two wires were also coated with Chatterton’s compound. In 1868 the Dunwich end of the cable was diverted to Lowestoft using 33 miles of new cable made by the India Rubber, Gutta Percha, and Telegraph Works Company; it was then referred to as the South Lowestoft cable. The cable was inherited by the GPO when the private telegraph companies were nationalized in 1870, and it was then leased to the Submarine Telegraph Company, which worked all of the continental cables. 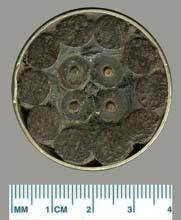 In 1885 a fault in the 1868 cable was picked up seven miles from Lowestoft, and a defective piece of core made into a display. The Times of Saturday last, in an article elsewhere referred to, gives the following account of new submarine telegraphic cables. In a short time Mr. Canning, we believe, will have to start with the great cable which is now being made at Glass and Elliot’s, and which is to be laid down for the Electric and International Telegraph Company between this country and the Hague. This is the largest and heaviest cable that has ever been yet manufactured, and it is not too much to say that no other makers, besides Glass and Elliot, in the world could produce a wire so massive, and yet so finely and perfectly finished. Up to the present time the electrical communications between this country and the Hague have been maintained nominally by four light ropes, each containing one copper conductor, and each covered with solid iron wire. We say nominally by four ropes, though really it has rarely been by more than two, as, from the shallowness of the water between Lowestoft and Holland, some one or more were always being injured by vessels’ anchors, so that it was constantly necessary to keep a steamer employed to pick them up, mend them, and lay them down again. To put an end once and for all to these perpetual sources of outlay, the company have determined on the present monster rope, combining the four wires in one and otherwise of such strength and weight that if a vessel is so unfortunate as to catch her anchor in it she will infallibly lose it, as beyond a doubt she can neither raise nor break this cable. It is composed of an inner rope of four separately insulated No. 13 copper wires, each cased in its own gutta percha, and the four twisted, with hemp between the interstices, into a rope. This is bound round by six large strands of greased hemp, and the whole enclosed with 10 iron wires which have no number in the trade, for each in fact is a small iron rod, being no less than 1⅛ inch in circumference. The weight of the whole cable is nearly 10 tons per mile, and its breaking strain is upwards of 100 tons. The length made is 140 miles; the distance between the points of landing—Dunwich, near Lowestoft, and Zandvoort, about 30 miles from the Hague—is about 98 or 100 miles. Nearly 50 per cent., therefore, is allowed for slack, a large margin considering the immense strength of the cable, and that the vessel may put any strain on it she pleases. The paying-out machines to be used on this occasion are simply double drums of great weight and strength, with friction clutches of equal power to the size and weight of the drums. This machine was used with the first Mediterranean cable, and for the cable laid by Mr. Canning across the Gulf of St. Lawrence. At Glass and Elliot’s works two other cables are also in progress, one for the Submarine Company, abont 300 miles long, between Cromer, in Norfolk, and Emden, in Hanover, and another for the same company to Denmark, near Cruxhaven, a distance of 380 miles. Both these cables will be heavy, as becomes the places they have to work across. A new exceptionally heavy underwater cable with four cores was laid by the Electric & International Telegraph Company between September 19 and 21, 1858 from Orfordness to Zandvoort in Holland to replace its original four lightweight circuits, which had suffered repeatedly from ships’ anchors. It was engineered by Latimer Clark and manufactured by Glass, Elliot & Company. The four old cables were then raised to recover the copper cores for scrap and reuse. This first Zandvoort cable was enveloped in drama and incident, with accusations of industrial sabotage. In the Guildhall Court in London, on February 20 and 21, 1861, Glass, Elliot, the makers of the 1858 Zandvoort cable, sued George Boswall, London agent of R S Newall, its chief competitor, for damages. Boswall was accused of engaging a man named Curtis to accompany the cable-laying expedition to drive a series of iron nails into the cable to destroy its insulation on submersion. Curtis admitted his actions to the court, but Boswall’s plot was only partially successful, as just one of the four cores was penetrated. His damage cost the Company something like £4,000 to £5,000 in attempts to repair. The new system of laying light cables in shoal water, from which the Channel Islands Company was suffering so grievously, was first adopted by the Electric Company in their lines from Orfordness to the Hague, where, instead of laying one strong and heavy iron cable, four comparatively light cables, each with one conductor only, were laid across the North Sea, on the principle, that the chances were against all the four being broken down at the same time. That system which had also been adopted between Dublin and Holyhead, had been, however, far from satisfactory, the annual cost for repairs having amounted, during several years, to from £10,000 to £12,000, and the Company had been, finally, compelled to lay a heavy cable from Dunwich to Zandvoort, in Holland, the working of which had been very successful. With respect to the paying out of cables, he would allude to a circumstance that repeatedly came under his notice. The captains of the vessels so employed, often steered direct from one point to another, being merely desirous of making the quickest passage, without reference to the position in which the cable should be laid. A vessel sailing direct from east to west, and encountering several tides, would deposit the cable in a number of zigzags. Such, for example, was the case between Dunwich and Zandvoort, on the coast of Holland; more cable being used, than was fairly required for the distance. Captains were, generally, so well satisfied with their own practical knowledge, that they often regarded the suggestions of landsmen, as an ignorant interference. But it was important to draw their attention to this fact, for by such steering, they not only wasted the cable, but they rendered it difficult, afterwards, to ascertain its position when repairs were required. Messrs. C.F. Varley and G. Preece, have been equally accurate in the North Sea. On one occasion, Mr. Varley pronounced a defect in the Zandvoort cable of the Electric and International Telegraph Company, to be 61 miles from the English shore, and it proved to be at the exact spot indicated. Mr. G. Preece, in testing on board ship, 13 miles from land, while repairing a break at that spot, found the cable again severed at a distance, according to his tests, of 50 miles towards Holland, and the break was found at 50¼ miles. My Dear Sir, —Referring to our conversation this morning upon telegraph cables, I subjoin a few facts that will doubtless interest you. The manufacture of gutta percha since 1857 has been greatly improved, and its insulating power increased thereby more than ten times. The Dunwich Zandvoort cable, made in 1858, and 134 statute miles in length, contains four conducting wires of 110 lb. to the statute mile; two of them are insulated with two coatings of gutta percha only. The other two are insulated also with two coatings of gutta percha, but between the wire and the first coat of gutta percha, and between the two layers of that material, there is a film of Chatterton’s compound (a mixture ot vegetable tars and gutta percha). The Lowestoft and Zandvoort cable, made in 1862, contains four conducting wires of similar dimensions to those in the Dunwich cable, but each wire is insulated with three coats of gutta percha, and between each of those coats there is a film of Chatterton’s compound. The insulation having improved in the ratio of 1 to 11. The 1858 (Dunwich Zandvoort) cable improved in insulating power considerably after submersion a few months, and although submerged four years, its insulation is now as high as it ever was. The conducting power of copper has likewise been considerably improved. 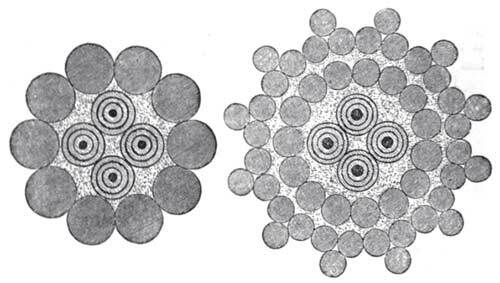 The conducting power of the 1862 cable is 25 per cent, greater than the 1858 cable; this improved conducting power increases the speed of the cable in a corresponding ratio. The appliances for testing cables during manufacture and otherwise have very considerably advanced; and minute leakages, that in 1858 would have escaped notice, are now easily detected. THE DUNWICH AND ZANDVOORT CABLE. This cable, the property of the Electric and International Telegraph Company, was manufactured and submerged for them by Messrs. Glass, Elliot, and Co., in the autumn of 1858. It consisted of four wires, and has been at work, with occasional interruptions, ever since; but it has been found that these interruptions—usually caused by ships’ anchors—which occur generally more than once a year, are not so frequent further north. The Lowestoft and Zandvoort cable, which has been laid for some time, has been comparatively free from accidents, while the Dunwich cable to the south has, as we have already stated, suffered considerably. The nature of the traffic and of the coast itself at once makes the fact apparent. The anchorage at Lowestoft is well protected by sands, and is close in shore. Outside the sands, from the easterly position of the place, but little protection can be found, and vessels working tides are usually carried well to one side or the other of Lowestoft, and rarely anchor on the line of the cable. At Dunwich the case is very different; from westerly and north-westerly winds there is good protection, and it is extraordinary the number of vessels that anchor off here working tides. The directors have wisely considered that it would be to their advantage to shift the landing-place of the cable, and on the recommendation of Mr. Culley, their engineer, they decided to bring the cable in to Lowestoft. This was rendered easier, for the cable as it approaches the English coast was laid too much to the northward in consequence of one straight course being steered across; the vessel was therefore carried each way by the tide, and on sighting the English coast, the ebb had carried them well to the northward; it has been, therefore, determined to pick up the present cable at the nearest spot, and lay a new section of improved manufacture to Lowestoft. For this purpose a length of thirty-three miles was offered for contract, the tender of the India-Rubber and Gutta Percha Company being accepted, and they forthwith proceeded with the manufacture of the cable at their works at Silvertown. Of this length of thirty-three miles, fifteen were to form a massive shore end, the remainder being main cable of a slightly different construction to the old Zandvoort cable. The core throughout the length was of the same construction, containing four well insulated conductors according to the following specification, each copper wire to be a strand of seven No. 22 wires, of the weight of 107lb. per knot; and at a temperature of 75deg. Fah. to give a resistance of not more than 12.07 Ohms per knot, and a specific conductivity of 92.34 per cent, of pure copper. The insulator to be of three coatings of gutta-percha with three alternate coatings of compound, of the weight of 150lb. per knot. The wire when insulated to give a resistance of not less than 250 millions of Ohms per knot after immersion for twentyfour hours in water at a temperature of 75deg. Fah. Each wire was numbered on the outside by longitudinal stripes from one to four. The advantage of having external means of knowing the number of wires is too obvious to need mention. The gutta-percha wires when manufactured and passed were wormed, and served in the ordinary manner with tanned jute, and then passed through the sheathing machine. The gutta-percha covered wires were manufactured in lengths averaging over 3,300yds. or rather more than 1.6 knot; the great advantage in having the lengths so long is reducing the number of joints as much as possible, for joints may be looked upon as the vulnerable point in a submarine cable. The sheathing in the eighteen miles of main cable consisted of eleven No. 1 best best galvanized soft iron wires (in order to have as few welds as possible, these wires were rolled by Messrs. Johnson, of Manchester, in lengths averaging over 1cwt. ): each wire was first passed through a bath of bituminous compound, and then served with two reverse servings of tarred Russian hemp. After the cable had been thus sheathed it was coated with bituminous compound as a still further protection. The main cable weighed about twelve tons per knot. * That this was the case may be readily imagined, when it is known that the cable contained about 900 miles of iron wire and nearly 10,000 miles of hempen strands. The whole, however, was satisfactorily completed and stowed away in the tanks ready forthe Company’s steamer "Monarch," to be taken away in her and submerged, the great weight of the cable, and the small capacity of the ship, rendering two trips necessary. Before the cable was completed, the "Monarch" took away two miles of the shore end and laid them from the cable house at Lowestoft over the sand. The completion of the cable was very much delayed by the vessel being required for repairing some cables that had broken down. On the 8th ult., however, she succeeded in laying the shore end, and on the 28th she completed laying the eighteen miles of main cable from the shore end, to which it was spliced, to the point where the junction with the main cable was to be effected. The lifting of the cable, cutting it, and making the splice with the cable recently laid, is all that is now required to complete the alteration. We trust now that the landing place has been changed, the company will benefit by the alteration, and that the continued working of the cable free from interruption will prove the wisdom of the alteration. The piece of cable from Dunwich to the place where it has to be cut will shortly be recovered. March 1885: Cable laid in 1868. The cable is of the seven-strand construction noted in the article on the 1868 diversion of the 1858 cable immediately above. The wall hangers and numbered plate suggest that this was one of the pieces displayed in the office of the Chief Engineer of the Post Office towards the end of the 19th century. The display remained in the Post Office collection until 2003, when together with many other items it was determined to have no historical value. It was then sold during the dispersal by auction of the contents of the BT Museum.